Carrie Warren, who works at Cambridge Assessment, has asked me to speak as she can’t be here today. The petition, which has nearly 4,000 signatures, calls for bus operators to reduce speed on a short section of the guided busway in my Trumpington ward until the results of the Health and Safety Executive investigation into the fatal accident on September 13 are published and can be considered, as it will make this section of the Busway safer for pedestrians and cyclists who are in close proximity to buses. I represent my Trumpington residents, and started this campaign in June. Now, I’m also representing the thousands of people who use the route and have signed the petition. I’m representing Carrie Warren who set it up, and Damien Pitt who was hit by the wing mirror of a passing bus, and the son and family of Stephen Moir who died this summer on the route, and the bus passenger who witnessed the accident. You might ask us to wait until the full report is published, but we do not believe this is enough. We want a safer route and we want to feel safer as well. Based on statistical evidence for the number of people injured or killed per vehicle movement, this Trumpington section of the guided bus is at least 8 times more dangerous than the A14. And we are concerned because the route does not feel safe. If you use the track to travel into town the buses will pass at intervals between 30 mins to 10 mins so you will not be sure when they will pass, unlike the constant or regular traffic on an urban road. This is the busiest section of a public right of way and cycleway on the whole of the guided bus route. At peak times hundreds of people use the route to get to or from the station, major businesses, Long Road 6thForm College, the Biomedical Campus, and Trumpington too. It is a unique section of track due to its intensive use. And the buses pass at up to 53mph, right at the edge of the track with only the 30cm kerb separating the bus from the track and those using it. As unexpected buses pass, you can feel a big push and pull as each goes past, and people sometimes try to move away from the raised kerb and cause a bunching on the other side of the path. This in itself can cause accidents. Some have asked how this reduction would affect the bus scheduling. Over the 700m section travelling at 20, rather than 53mph will add less than 1 ½ minutes to the journey. It will be less than this as the buses have to be slowing down on the last part to be travelling at 15mph when they leave the guided section. 1 – 2 minutes is negligible. Just getting caught at a few red lights, or typical congestion in the unguided section will add this and surely the schedules already have some flexibility built in. This is one of the busiest paths next to a bus route and it currently has the fastest speed restriction. No where else in Cambridge City do vehicles travel this fast. Many busy streets in Cambridge have a restriction of 20mph for a good reason, safety. And this route should as well. So I call upon councillors to act on the real concerns of local residents and those who use the path and support the move to limit the speed of buses on this part of the busway. This will not solve all of the safety problems More needs to be considered in conjunction with user groups and with public consultations. 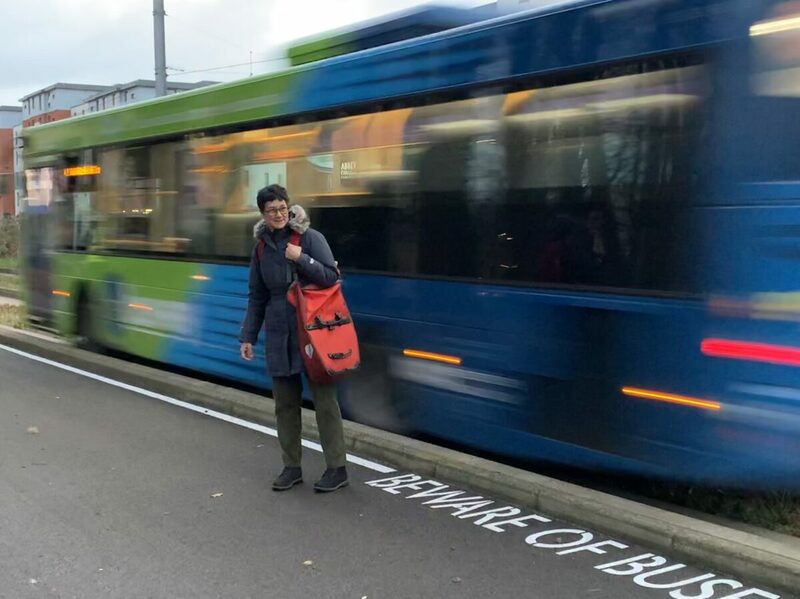 My campaigning has resulted in a white line to highlight the track kerb edge and safety notices, but slowing the buses will greatly increase the chances of a bus being able to stop if someone is in difficulty on the track.